For the climate forcing agent, see Black carbon. For the Carbon Black security company, see Carbon Black (company). Carbon black (subtypes are acetylene black, channel black, furnace black, lamp black and thermal black) is a material produced by the incomplete combustion of heavy petroleum products such as FCC tar, coal tar, or ethylene cracking tar. Carbon black is a form of paracrystalline carbon that has a high surface-area-to-volume ratio, albeit lower than that of activated carbon. It is dissimilar to soot in its much higher surface-area-to-volume ratio and significantly lower (negligible and non-bioavailable) polycyclic aromatic hydrocarbon (PAH) content. 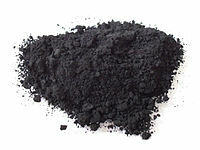 However, carbon black is widely used as a model compound for diesel soot for diesel oxidation experiments. Carbon black is mainly used as a reinforcing filler in tires and other rubber products. In plastics, paints, and inks, carbon black is used as a color pigment. Total production was around 8,100,000 metric tons (8,900,000 short tons) in 2006. Global consumption of carbon black, estimated at 13.2 million metric tons, valued at US$13.7 billion, in 2015, is expected to reach 13.9 million metric tons, valued at US$14.4 billion in 2016. Global consumption is forecast to maintain a CAGR (compound annual growth rate) of 5.6% between 2016 and 2022, reaching 19.2 million metric tons, valued at US$20.4 billion, by 2022. The most common use (70%) of carbon black is as a pigment and reinforcing phase in automobile tires. Carbon black also helps conduct heat away from the tread and belt area of the tire, reducing thermal damage and increasing tire life. About 20% of world production goes into belts, hoses, and other non-tire rubber goods. The balance is mainly used as a pigment in inks, coatings and plastics. For example, it is added to polypropylene because it absorbs ultraviolet radiation, which otherwise causes the material to degrade. Carbon black particles are also employed in some radar absorbent materials, in photocopier and laser printer toner, and in other inks and paints. The high tinting strength and stability of carbon black has also provided use in coloring of resins and films. Carbon black has been used in various applications for electronics. A good conductor of electricity, carbon black is used as a filler mixed in plastics, elastomer, films, adhesives, and paints. It is used as an antistatic additive agent in automobile fuel caps and pipes. Carbon black from vegetable origin is used as a food coloring, known in Europe as additive E153. It is approved for use as additive 153 (Carbon blacks or Vegetable carbon) in Australia and New Zealand but has been banned in the US. The color pigment carbon black has been widely used for many years in food and beverage packaging. It is used in multi-layer UHT milk bottles in the US, parts of Europe and Asia, and South Africa, and in items like microwavable meal trays and meat trays in New Zealand. Within Australasia, the color pigment carbon black in packaging must comply with the requirements of either the EU or US packaging regulations. If any colorant is used, it must meet European partial agreement AP(89)1. The highest volume use of carbon black is as a reinforcing filler in rubber products, especially tires. While a pure gum vulcanization of styrene-butadiene has a tensile strength of no more than 2 MPa and negligible abrasion resistance, compounding it with 50% carbon black by weight improves its tensile strength and wear resistance as shown in the table below. It is used often in the aerospace industry in elastomers for aircraft vibration control components such as engine mounts. Practically all rubber products where tensile and abrasion wear properties are important use carbon black, so they are black in color. Where physical properties are important but colors other than black are desired, such as white tennis shoes, precipitated or fumed silica has been substituted for carbon black. Silica-based fillers are also gaining market share in automotive tires because they provide better trade-off for fuel efficiency and wet handling due to a lower rolling loss. Traditionally silica fillers had worse abrasion wear properties, but the technology has gradually improved to a point where they can match carbon black abrasion performance. Lamp black was traditionally produced by collecting soot from oil lamps. All of these types of carbon black were used extensively as paint pigments since prehistoric times. Rembrandt, Vermeer, Van Dyck, and more recently, Cézanne, Picasso and Manet employed carbon black pigments in their paintings. A typical example is Manet's "Music in the Tuileries", where the black dresses and the men's hats are painted in ivory black. Newer methods of producing carbon black have largely superseded these traditional sources. For artisanal purposes, carbon black produced by any means remains common. The coatings and inks industries prefer grades of carbon black that are acid-oxidized. Acid is sprayed in high-temperature dryers during the manufacturing process to change the inherent surface chemistry of the black. The amount of chemically-bonded oxygen on the surface area of the black is increased to enhance performance characteristics. Carbon black is considered possibly carcinogenic to humans and classified as a Group 2B carcinogen because there is sufficient evidence in experimental animals with inadequate evidence in human epidemiological studies. The evidence of carcinogenicity in animal studies comes from two chronic inhalation studies and two intratracheal instillation studies in rats, which showed significantly elevated rates of lung cancer in exposed animals. An inhalation study on mice did not show significantly elevated rates of lung cancer in exposed animals. Epidemiologic data comes from three cohort studies of carbon black production workers. Two studies, from the United Kingdom and Germany, with over 1,000 workers in each study group showed elevated mortality from lung cancer. A third study of over 5,000 carbon black workers in the United States did not show elevated mortality. Newer findings of increased lung cancer mortality in an update from the UK study suggest that carbon black could be a late-stage carcinogen. However, a more recent and larger study from Germany did not confirm this hypothesis. There are strict guidelines available and in place to ensure employees who manufacture carbon black are not at risk of inhaling unsafe doses of carbon black in its raw form. Respiratory personal protective equipment is recommended to properly protect workers from inhalation of carbon black. The recommended type of respiratory protection varies depending on the concentration of carbon black used. People can be exposed to carbon black in the workplace by inhalation and contact with the skin or eyes. The Occupational Safety and Health Administration (OSHA) has set the legal limit (Permissible exposure limit) for carbon black exposure in the workplace at 3.5 mg/m3 over an 8-hour workday. The National Institute for Occupational Safety and Health (NIOSH) has set a Recommended exposure limit (REL) of 3.5 mg/m3 over an 8-hour workday. At levels of 1750 mg/m3, carbon black is immediately dangerous to life and health. ^ "Experimental and kinetic study of the interaction of a commercial soot toward no at high temperature" (PDF). Retrieved 2012-04-25. ^ "Market Study: Carbon Black". Ceresana. Retrieved 2013-04-26. ^ a b c d e f Kuempel, Eileen D.; Sorahan, Tom (2010). "Identification of Research Needs to Resolve the Carcinogenicity of High-priority IARC Carcinogens" (PDF). Views and Expert Opinions of an IARC/NORA Expert Group Meeting, Lyon, France, 30 June – 2 July 2009. IARC Technical Publication No. 42. Lyon, France: International Agency for Research on Cancer. 42: 61–72. Retrieved August 30, 2012. ^ "What is carbon black". International carbon black Association. Archived from the original on 2009-04-01. Retrieved 2009-04-14. ^ a b c "Application Examples of carbon black". Mitsubishi Chemical. Retrieved 2013-01-14. ^ US FDA: "Colour Additive Status List". Retrieved 2011-10-27. ^ "Draft Screening Assessment for the Challenge". Retrieved 2013-01-14. ^ "Australia New Zealand Food Standards Code". Retrieved 2013-01-14. ^ Winter, J. and West FitzHugh, E., Pigments based on Carbon, in Berrie, B.H. Editor, Artists’ Pigments, A Handbook of Their History and Characteristics, Volume 4, pp. 1–37. ^ Bomford D, Kirby J, Leighton, J., Roy A. Art in the Making: Impressionism. National Gallery Publications, London, 1990, pp. 112–119. ^ Sorahan T, Harrington JM (2007). "A "lugged" analysis of lung cancer risks in UK carbon black production workers, 1951–2004". Am J Ind Med. 50 (8): 555–564. doi:10.1002/ajim.20481. PMID 17516558. ^ Ward EM, Schulte PA, Straif K, Hopf NB, Caldwell JC, Carreón T, DeMarini DM, Fowler BA, Goldstein BD, Hemminki K, Hines CJ, Pursiainen KH, Kuempel E, Lewtas J, Lunn RM, Lynge E, McElvenny DM, Muhle H, Nakajima T, Robertson LW, Rothman N, Ruder AM, Schubauer-Berigan MK, Siemiatycki J, Silverman D, Smith MT, Sorahan T, Steenland K, Stevens RG, Vineis P, Zahm SH, Zeise L, Cogliano VJ (2010). "Research recommendations for selected IARC-classified agents". Environmental Health Perspectives. 118 (10): 1355–62. doi:10.1289/ehp.0901828. PMC 2957912. PMID 20562050. ^ Morfeld P, McCunney RJ (2007). "Carbon black and lung cancer: Testing a new exposure metric in a German cohort". Am J Ind Med. 50 (8): 565–567. doi:10.1002/ajim.20491. PMID 17620319. ^ "Occupational Safety and Health Guidelines for carbon black: Potential Human Carcinogen, Centres of Disease Control and Prevention, National Institute for Occupational Safety and Health" (PDF). Retrieved 2013-01-14. ^ "Occupational Safety and Health Guideline for Carbon Black: Potential Human Carcinogen" (PDF). Centers of Disease Control and Prevention, National Institute for Occupational Safety and Health. Retrieved 11 January 2013. ^ "CDC – NIOSH Pocket Guide to Chemical Hazards – Carbon black". www.cdc.gov. Retrieved 2015-11-27. Carbon Black: A users guide. Published by the International Carbon Black Association. Wikisource has the text of a 1920 Encyclopedia Americana article about Carbon black. Wikimedia Commons has media related to Carbon black.